Butane and propane consist of gases used as fuel to produce heat. 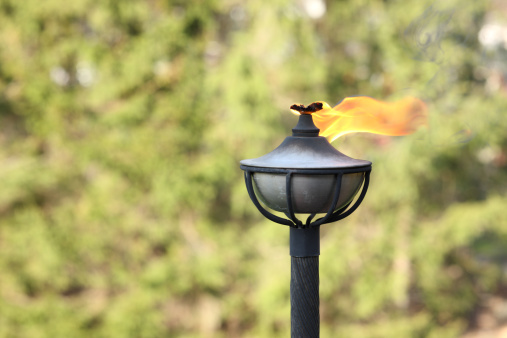 Propane tanks commonly fuel barbecue grills, small stoves, engines and torches, while butane sees practical uses for handheld lighters, lanterns and mini craft torches. Propane has higher pressure temperature points than butane and comes in bottles or cylinders. Butane often comes in smaller cans. Both gases contain similar properties in that they contain petroleum as a main base product. Propane and butane have some different storage requirements. Propane is a common source of fuel for forklifts. Butane canisters (or small cans) provide easier individual storage options than larger propane bottles. Owed to their small size, butane canisters can be stored together, individually boxed or wrapped in a protective sleeve, such as Styrofoam or heavy cloth. Butane canisters have federal labels affixed to them, outlining the storage conditions, such as maximum hot and cold heat ranges. Safe temperature ranges, in general, range from 32 degrees to 125 degrees Fahrenheit. Butane requires a cool and dry environment. Butane must be stored indoors at all times. It should be locked away (if applicable), and out of reach of small children. Due to their smaller size, butane canisters can be stored in large drawers, cupboards, garages, closets and utility storerooms. Butane can not be placed in direct sunlight for any length of time, so the storage area should be dark and away from the sun's rays. The storage area should not be in proximity to an electrical outlet, hot bulb, stove, toaster or other heat source. Butane should not be stored in automotive vehicles. Large propane bottles or cylinders can be stacked side by side on their bottoms, or resting on their sides within wooden or metal containers that can keep them from rolling. If resting on their sides, the relief valve should be positioned above the liquid level of the bottle. The storage areas for upright propane bottles should have a hard flat surface, such as concrete or stiff wooden flooring that has proper drainage for run-off water. Propane must be located away from high traffic areas and any open flames or ignition sources, such as generators or heaters. Propane bottles should be plainly marked with stickers or placards on their exterior shells. Propane, because of its lower boiling point and higher pressure point than butane, should be stored outside. 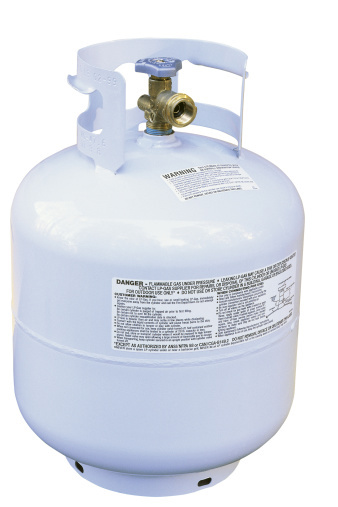 Bottled propane can withstand harsh outside weather conditions and temperatures for prolonged periods. It must be located away from high traffic areas and any open flames or ignition sources, such as generators or heaters. Propane cylinders should not rest on grass, mud or dirt where moisture can rust the metal tank components. If tall cylinders need to be stored upright and near each other, the cylinders need to be braced with bungee cords or thick duct tape to prevent falling. Chris Stevenson has been writing since 1988. His automotive vocation has spanned more than 35 years and he authored the auto repair manual "Auto Repair Shams and Scams" in 1990. Stevenson holds a P.D.S Toyota certificate, ASE brake certification, Clean Air Act certification and a California smog license.